Striker Jayden Stockley netted his first goal for the Hatters as they extended their unbeaten run to eight games with a 1-1 draw against Oxford United this afternoon. The visitors handed an instant debut to winger Ryan Hall as Scott Griffiths missed out meaning Jake Howells dropped to left back, with deadline day signing Nathan Oduwa on the bench. Luton then had a marvellous opportunity after six minutes when Shaun Whalley’s cross rebounded for Hall, and from eight yards out, his fierce low drive drew a superb reaction stop from Ryan Clarke as Stockley’s rebound deflected behind. However, chances for either side then dried up completely as the game was devoid of absolutely any incident, so it came as something of a surprise when it burst into life on 30 minutes. First, Oxford missed a marvellous opportunity when Danny Hylton sent strike partner Patrick Hoban through as he beat the offside trap but dallied and Mark Tyler stood up well to block for a corner. Play then went up the other end with Hall’s shot charged down, but Luton wrested the initiative in terms of territory as they started to crank up the pressure which led to an opening goal. There was an incident of controversy in the build up as from an Oxford clearance, Luke Wilkinson appeared to clearly foul Hylton, but nothing was given. The home supporters murmurings understandably grew even louder when the ball was worked wide for Whalley and his cross shot was touched goalwards by Stockley, just about beating the despairing dive of Clarke to trundle in off the post. Oxford didn’t let their heads drop though as they dominated the final five minutes of the half, with Alex MacDonald firing across goal and Steve McNulty having to head over his own bar from the trick Callum O’Dowda’s cross. From the corner, Town couldn’t clear their lines and Jonny Mullins drove into the bottom corner to bring the scores level, with McNulty booked for his actions in the aftermath. A clever free kick saw Hoban have a fine opportunity to immediately make it 2-1, but skied well over the bar. The second period saw Oxford easily enjoy the better of proceedings, with Luton under the cosh for some time. First MacDonald headed over at the back post, while Josh Ruffels volleyed over from another set-piece. With the bit between their teeth, MacDonald almost embarrassed Tyler as his low shot took a nasty bobble and was just pushed behind. The U’s should have been 2-1 ahead though when Mullin again was left completely unmarked, but fluffed his lines, heading badly wide from close range. Oxford were convinced they did have a second moments later as Hoban diverted Hylton’s cross shot into the roof of the net, but he had been flagged offside. O’Dowda was next to come close, tamely poking at Tyler when a decent connection would have left Town’s stopper in real trouble. Although Hatters looked to have finally weathered the storm, MacDonald served a warning as he found space to fire wide of the mark. Town chief John Still rang the changes, with Mark Cullen and Spurs youngster Oduwa brought on, as was striker Alex Wall, for his first league action since netting a winner at Stevenage on October 4. Oxford threw on James Roberts who almost made an immediate impact, tricking his way past Town’s defence, with Tyler coming to the rescue once more. Hugging the left flank, Oduwa started to get into his stride as he was handed the ball at ever chance to try and isolate full back Sam Long, hurdling a nasty challenge that saw the sub booked. His directness could prove a vital asset in Luton’s promotion push though, venturing into the box and firing over, before a deep cross saw Cullen head off target. The Hatters definitely had the better of the final stage, with Oduwa causing havoc at times. A free kick 30 yards from goal was thundered through the wall by Wall, but Clarke just about managed to keep it out, as an offside Cullen couldn’t turn home the rebound. Oduwa had two penalty appeals turned down, the second as he was brought down just outside the area, while Jonathan Smith swerved an ambitious effort wide meaning Town were held to a second successive 1-1 away draw. 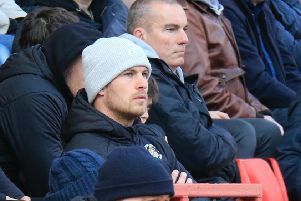 The result saw Luton remain in fourth place, but they fell six points behind new leaders Burton, who won 3-1 at Cheltenham. Town are still four points off third though, now occupied by Shrewsbury, who drew with Southend, although still have a game in hand over all the top three side. U’s: Ryan Clarke, Joe Skarz, Richard Brindley (Sam Long 73), Johnny Mullins, Jake Wright (C), Patrick Hoban, Danny Hylton, Alex MacDonald (James Roberts 67), Josh Ruffels, Callum O’Dowdan, Michael Collins. Subs not used: Danny Rose, Max Crocombe, Josh Ashby, Sam Humphreys, Chey Dunkley. Hatters: Mark Tyler, Michael Harriman, Jake Howells, Luke Wilkinson, Steve McNulty (C), Nathan Doyle, Jonathan Smith, Andy Drury, Shaun Whalley (Mark Cullen 59), Ryan Hall (Nathan Oduwa 59), Jayden Stockley (Alex Wall 69). Subs not used: Elliott Justham, Luke Guttridge, Matt Robinson, Alex Lacey. Booked: McNulty 44, Skarz 64, Collins 72, Long 74.